We just completed an analysis of 42,982 posts by 1,007 college and university pages. In a previous post, we examined some specific trends we found while analyzing the 500 most-engaging posts for the month. In this post, we'll dig deeper into the numbers for all the October 2014 posts. We hope our analysis helps uncover some new insights for you, validates some hunches you may have had, and provides benchmarks for your own efforts. We recently updated our Facebook Page Directory to include categorization by audience (General, Admissions, and Alumni). We had long ago hypothesized about the potential for segmentation in engaging your audience. Your prospects likely want very different information from your Facebook Page than your alumni. 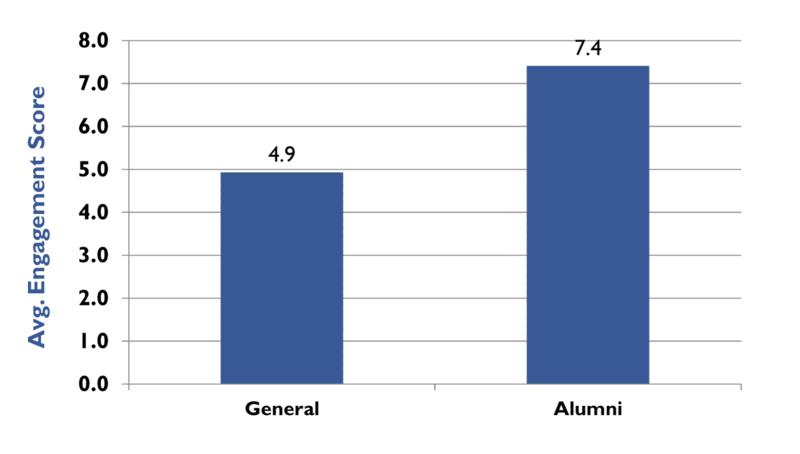 The engagement rates of alumni pages vs. general pages seems to support this hypothesis. 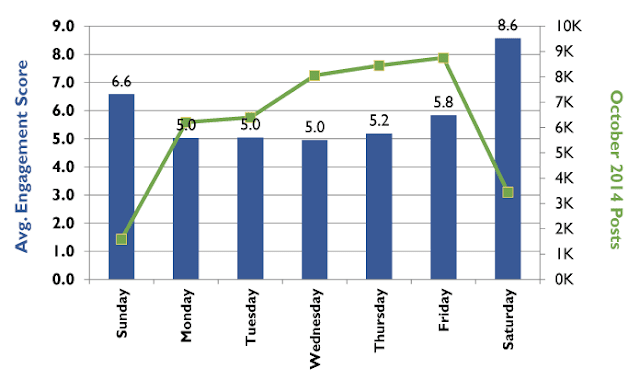 For the month of October, posts on Saturdays generated, by far, the most engagement. We believe the #1 reason for this is fairly straightforward… it's college football season. We also have a hunch that people have more time to check Facebook on the weekends, which is why posts on Sundays also tend to generate more engagement. Looking to get your audience to like your content, then definitely share a photo. They get liked at a much higher rate than any other type of post. However, on average, videos generate more shares, and text-only status posts generate more comments. We grouped pages into tranches of 50 based on their post frequency so we could look at the relationship between post frequency and average engagement scores. The 50 pages that posted the most in October 2014 are in the 1-50 tranche, averaging 147 posts for the month. The next 50 most frequent posters are in 51-100, averaging 95 posts for the month. And so on. As with past analyses, we again see a general trend that engagement score per post tends to increase as the frequency of posts decrease. We included a chart with the raw data as well as a graph on the engagement score by tranche, which makes this trend a bit more noticeable. 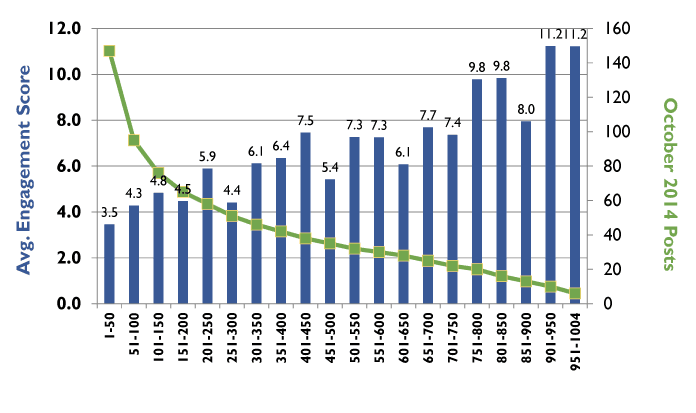 The green line is the average number of posts for the school in the tranche and the blue bars are the average engagement scores per post for the schools in the tranche. 6 Jackson State University National Alumni Association, Inc.